There is perhaps no item more essential to the traditional Old West look than a fantastic Western hat. 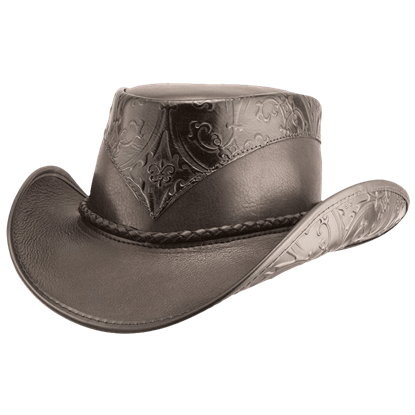 We carry an excellent selection of cowboy hats, sheriff hats, Stetsons, and other leather hats for daily wearing, costuming, historical reenactments, or use as stage props. Our Wild West hats come in a range of sizes and styles to suit any need. Whether you want to dress as an outlaw, a U.S. Marshal, a Texas Ranger, a sharpshooter, or a cattle rustler, you can be sure to find an Old West hat to suit your look. Certain designs even feature rattlesnakes, braided bands, airbrushed graphics, and other accents to help them stand out. Our Western headwear will send you back to the time of Calamity Jane, Buffalo Bill, Butch Cassidy, Billy the Kid, Annie Oakley, and other iconic figures of the West. 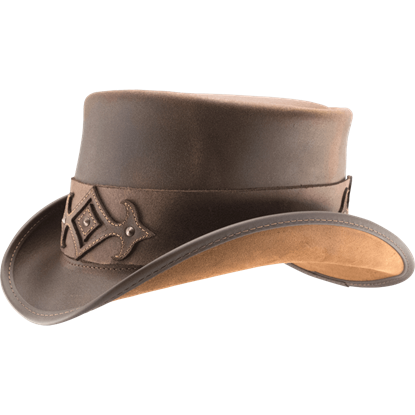 For a cowboy hat that is great for the farm and even better for formal events, pick up the Falcon Western Hat. A truly versatile item, this hat is capable of showing your rough and tumble side, as well as your fashionable side. Your unique sense of style will be evident when you show up wearing the Lace Concho El Dorado Hat. 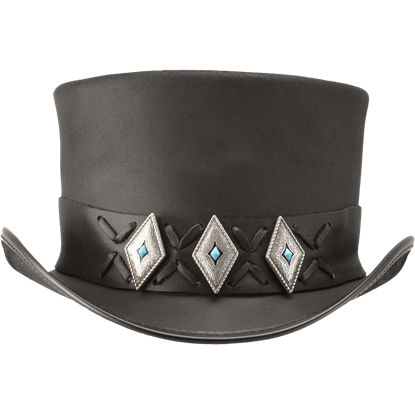 This handmade top hat displays a wide band with diamond shaped conchos. Lacing decorates the space between the silver tone accents. 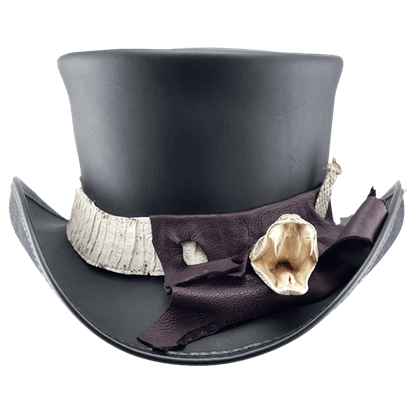 Lend sinister western style to any look when you top off your outfit with the Pale Rider Skull Band Top Hat. 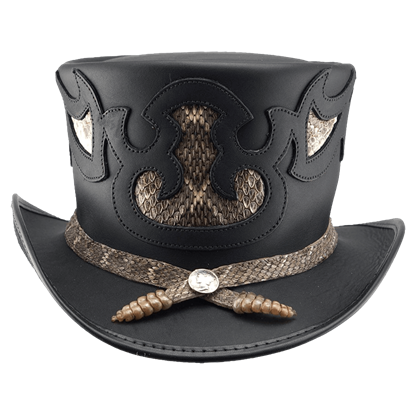 Handcrafted in the US out of high quality, black finish leather, this artisan top hat features a rattlesnake around its band. 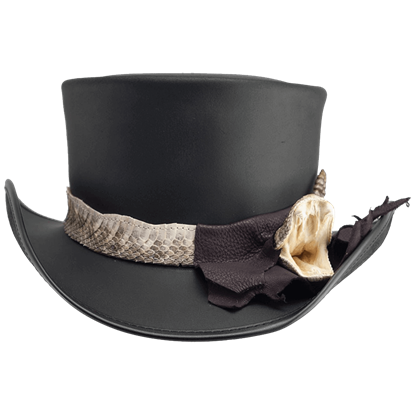 A wild, western theme combines well with this leather top hat to create something that is quite the eye-catcher. 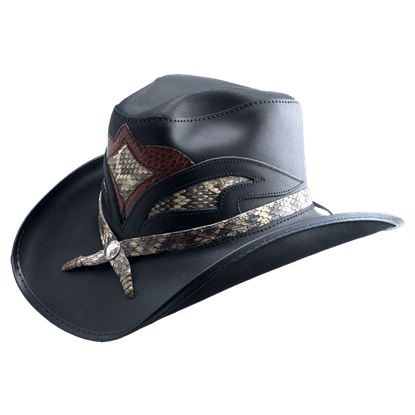 The Rio Topper Snakeskin Top Hat is a stunning accent that draws the eye and holds attention, thanks to its unique look. Nothing quite says wild man like this hat. 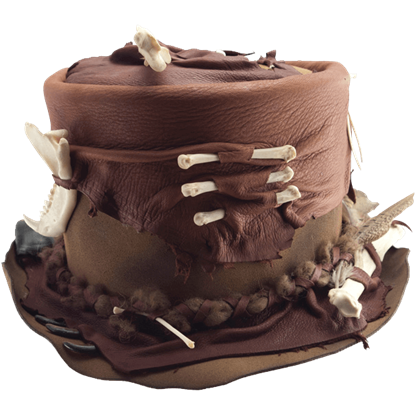 Impressive and intimidating, this Roadkill Top Hat is an eccentric touch of style for the hunter, explorer, or bushman in any age who likes to show off his prowess on the hat atop his head. 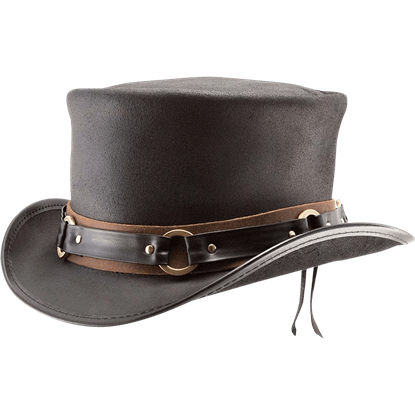 Reminiscent of a pork pie but with a distinctive brim, the Silverado Western Hat is lean and mean. Leave the brim low for a gun slinger look, or you can bend it up and give it some attitude. This hat is one fierce piece of headwear. If the SR2 Eldorado Steampunk Hat gives you mixed feelings, then you are not alone. While undeniably attractive, it sends a mixed message that this is a hat that looks appropriate for either a villain or an explorer. Make a statement with the Storm Snakeskin Hat. With rattlesnake, alligator, and lizard elements crafted into the pinched crown, this hat is a showstopper, ideal for a true outdoorsman who wants to add some flair to an outfit. Displaying a wide band with hand sewn details, the Waist Band El Dorado Hat is a stalwart leather hat with universal appeal. Handcrafted from leather, this steampunk top hat features a reversible band for two discrete presentations. A true lone wolf, the cowboy knows solitude as he herds his cattle throughout the prairies and grasses of the Wild West. 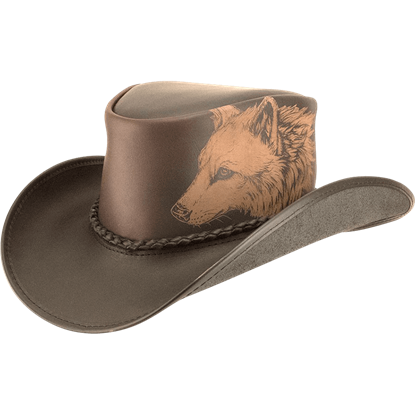 The Wana Western Hat displays a gorgeous, laser engraved image of a wolf on the side of its crown. 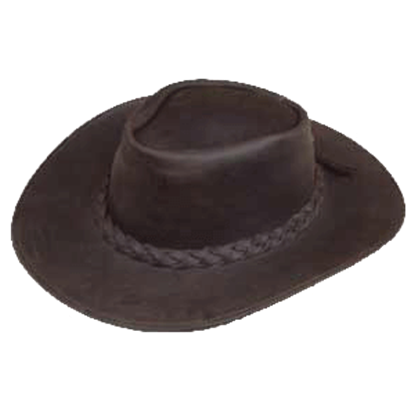 This leather Western hat is great for finishing your cowboy outfit or use as a stage prop. The Western hat comes in a variety of sizes and is only available in brown. 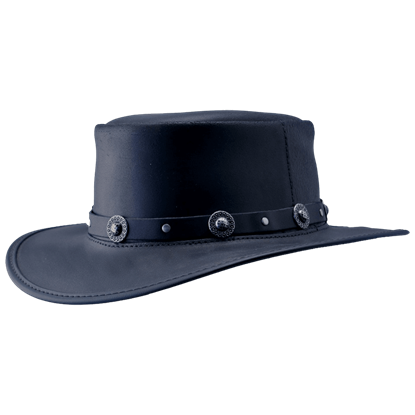 The cowboy hat has a braided leather band around the base of the hat.